Members of the committee, thank you for allowing me to speak with you today. My name is David Cooper. I am a senior analyst at the Economic Policy Institute (EPI). EPI is a nonpartisan, nonprofit research organization in Washington, D.C., whose mission is to analyze the economy through the lens of the typical U.S. working family. EPI researches, develops, and advocates for public policies that help ensure the economy provides opportunity and fair rewards for all Americans, with a focus on policies to support low- and middle-income households. I am testifying in support of H.B. 5004, which would raise the Connecticut minimum wage to $15 per hour by January 2022 and then index it to inflation thereafter. In my testimony, I will discuss why $15 in 2022 would be an appropriate level for the Connecticut minimum wage and how it would help ensure that low-wage workers share in the benefits of economic growth. I will briefly summarize what the economics literature tells us about how an increase to such a level is likely to affect workers, businesses, and the broader Connecticut economy. I will then discuss why claims that a $15 minimum wage will damage the state’s labor market are unfounded and obscure the more important question of how a $15 minimum wage will affect the welfare of the state’s low-wage workers and their families. Figure A shows the nominal and real (inflation-adjusted) values of the prevailing minimum wage in Connecticut since the late 1930s. 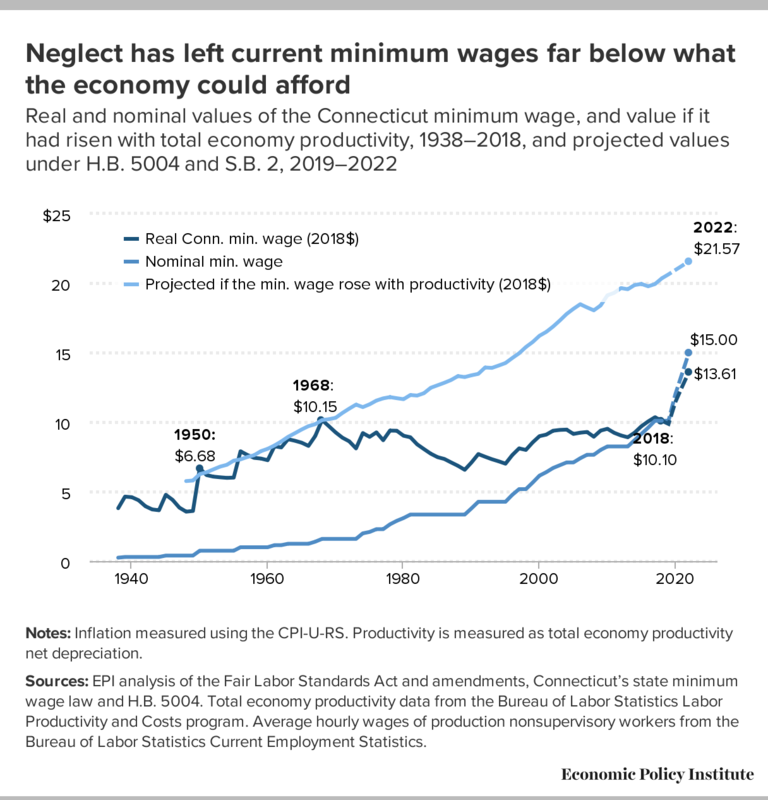 From the late 1940s until the late 1960s, the federal minimum wage—which covered workers in Connecticut—was raised regularly, at a pace that roughly matched growth in average U.S. labor productivity. The federal minimum wage reached an inflation-adjusted peak value in 1968 of $10.15 per hour in 2018 dollars.1 In the decades that followed, Congress made infrequent and inadequate adjustments to the federal minimum wage that never undid the erosion in value that occurred due to inflation in the 1970s and 1980s. Sources: EPI analysis of the Fair Labor Standards Act and amendments, Connecticut’s state minimum wage law and H.B. 5004. Total economy productivity data from the Bureau of Labor Statistics Labor Productivity and Costs program. Average hourly wages of production nonsupervisory workers from the Bureau of Labor Statistics Current Employment Statistics. Since the early 1990s, Connecticut lawmakers have stepped in to do more for the state’s low-wage workers, although even these efforts have arguably been inadequate. Connecticut relied on the federal minimum wage until 1991, when the state began setting a minimum wage above the federal level. Until the most recent increase in 2017, the state minimum wage was still lower than the inflation-adjusted value in 1968. With the last increase to $10.10 in 2017, the state raised its minimum wage to essentially the same value it had 50 years ago. Having the same minimum wage as a generation ago is an extremely low bar for what should be considered an appropriate labor standard for Connecticut workers today. Over the past 50 years, the country has experienced tremendous growth, and the economy’s capacity to deliver higher wages—through improvements in productivity—has more than doubled. The top line in Figure A shows that had the minimum wage kept pace with labor productivity growth since 1968, it would be $21.57 per hour by 2022. Increasing the Connecticut minimum wage to $15 by 2022, as proposed in H.B. 5004 and S.B. 2, would be an important corrective to our failure to raise minimum wages more appropriately. A $15 minimum wage in 2022 would ensure that a portion of the country’s labor productivity gains are translated into higher wages and living standards for Connecticut’s low-wage workers. Table 1 shows that $15 in 2022 is the equivalent of $13.61 in 2018 dollars, based on the Congressional Budget Office’s projections for inflation.2 This means that a $15 minimum wage in 2022 would represent a 34.7 percent real (inflation-adjusted) increase over the current state minimum and a 34.1 percent increase in purchasing power over the 1968 value of the minimum wage. Again, it’s important to recognize that since 1968, the economy’s capacity to deliver higher wages and living standards will have grown by 113 percent by 2022. Thus, raising the minimum wage 34 percent above the previous high point would allow low-wage workers in Connecticut to share in some—albeit less than one-third—of the economy’s productivity improvements of the past 50 years. * Projected real values based on projections for the CPI in CBO 2018. ** Projections for median wage growth assume 0.5% real wage growth, i.e., 0.5% above inflation. 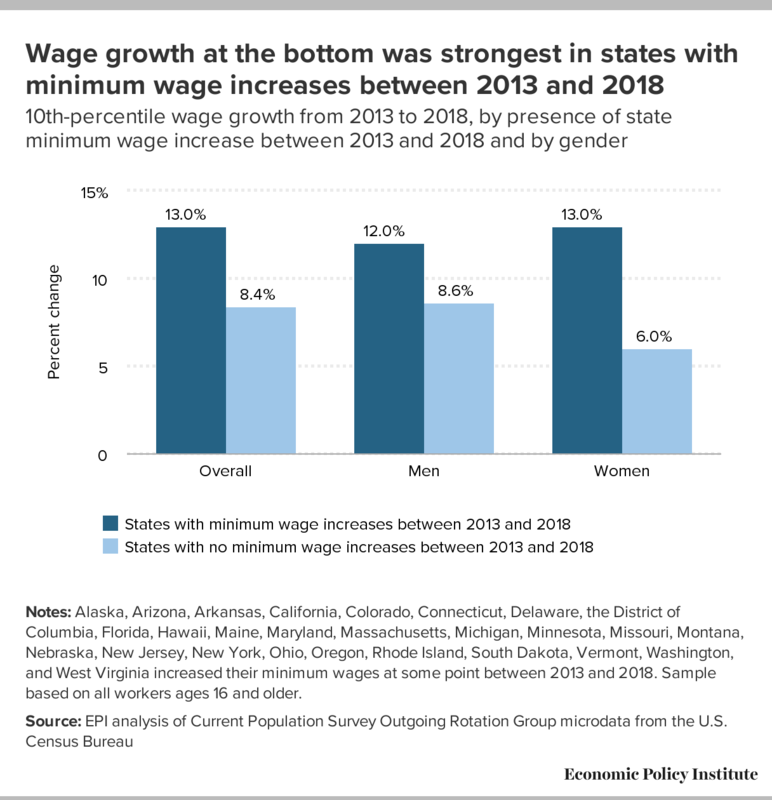 Raising the state minimum wage to $15 by 2022 would also help to combat some of the extreme growth in inequality that the country, and Connecticut in particular, have experienced over the past 50 years. Table 1 also shows the gap, in inflation-adjusted dollars, between the minimum wage and the median wage (i.e., the wage of someone at the exact middle of the wage distribution), as well as the minimum wage as a percentage of the median wage. These measures tell us how far the lowest-paid worker in the economy is from typical (or middle-wage) worker in the economy. In 1968, at the high point of the federal minimum wage, the gap between the minimum wage and the median wage was about $10 per hour in today’s dollars. Minimum wage workers were paid just over half (52.8 percent) of what typical middle-class workers were paid. Today, the gap between the federal minimum wage and the wage of a typical U.S. worker is about $15. Someone receiving the federal minimum wage is being paid less than a third (32.4 percent) of what a typical middle-class worker is paid. Even though Connecticut has a higher state minimum wage than the federal minimum, because wages in Connecticut are higher than the national average, the inequality between minimum wage workers and middle-wage workers in Connecticut is similar to what exists for the U.S. as a whole. The gap between Connecticut’s current $10.10 minimum wage and the median wage in Connecticut is $15.64—slightly larger in dollar terms than the gap at the national level. In percentage terms, a minimum wage worker in Connecticut is paid 39.2 percent of the wage of the median full-time worker in the state. If the state minimum wage is raised to $15 by 2022, it would bring Connecticut’s lowest-paid workers much closer to the middle class. As shown in Table 1, under conservative assumptions for wage growth over the next few years, a $15 minimum wage would narrow the gap between the minimum wage and the median wage to an estimated $12.63. The minimum wage would equal approximately 52 percent of the median wage in the state in 2022—nearly the exact same percentage that the federal minimum wage equaled in 1968. 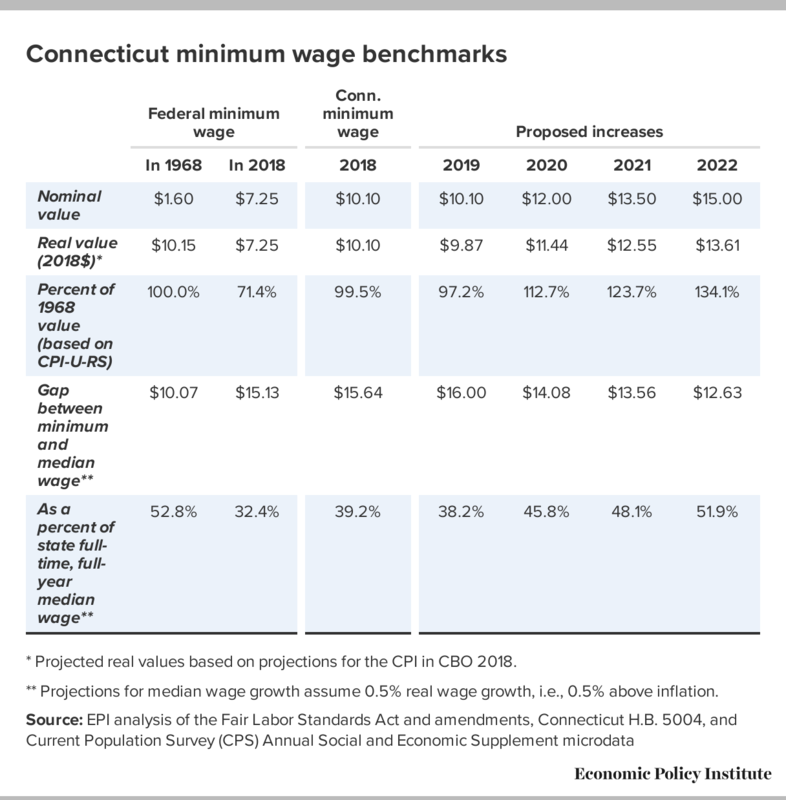 In other words, raising the Connecticut minimum wage to $15 by 2022 would essentially undo the growth in wage inequality between low- and middle-wage workers that has occurred in Connecticut over the past 50 years. A full-time worker receiving the minimum wage in Connecticut would be effectively as close to the middle class as his or her counterpart in the late 1960s. Whenever any minimum wage increase is proposed, concerns are always raised about the impact such a policy change might have on the employment of low-wage workers.3 Given this, it is not surprising that the effect of the minimum wage on employment has been one of the most heavily studied topics in economics, particularly since the 1990s when—after a decade of no change in the federal minimum wage—states began raising their minimum wages, creating an opportunity for researchers to more precisely study the effects of the policy. Although there sometimes appears to be controversy about the size of the minimum wage’s effects on employment, the bulk of research over the past two decades has largely concluded that minimum wage increases have worked exactly as intended: raising pay for low-wage workers, with little to no impact on employment. Economists Paul Wolfson and Dale Belman reviewed 15 years of research published since 2001 on the minimum wage—which comprised 739 estimates published in 37 studies—and found that the average effect reported was very small.4 They concluded that there was “no support for the proposition that the minimum wage has had an important effect on U.S. employment.” In fact, in subsequent research Wolfson and Belman found statistical evidence that there is a bias toward publishing findings showing a negative employment effects, meaning that the true effect is likely smaller than the average published study would suggest.5 Moreover, Sylvia Allegretto and several co-authors find that studies that employ the most credible research designs (comparing similar jurisdictions that have raised their minimum wage with those that have not) also find little to no effect on employment.6 Taken all together, these findings indicate that both the average study and the highest-quality studies find that there has been little downside to raising minimum wages. Importantly, even research on relatively high minimum wages has reached this same conclusion—that there does not appear to be any sizable negative effect on jobs from raising the wage floor. In what has been hailed as the most important work on the minimum wage in 25 years, Doruk Cengiz and co-authors employed a novel methodology to examine the effects of 138 state minimum wage changes that occurred in the United States between 1979 and 2014.7 They found that even with minimum wages rising as high as 55 percent of the median wage—higher than what is being proposed for Connecticut—there was no evidence of any reduction in the total number of jobs for low-wage workers.8 Moreover, the researchers examined effects specifically for workers without a college degree, underrepresented minorities, and young workers—groups that might have greater difficulty in finding work—and still found no evidence of substantial job losses. Modest price increases, on the scale of 0.3–5 percent per 10 percent increase in the minimum wage.11 These increases can be more easily absorbed as a result of concurrent boost in pay to a large portion of the region’s workforce, combined with the fact that all area businesses will be facing similar increases in labor costs—i.e., no single business will be at a competitive disadvantage if they all must raise prices. Research by my colleague Elise Gould has shown that in recent years, as numerous states have enacted higher minimum wages, there has been a clear pattern of low-wage workers in those states seeing faster wage growth than their counterparts in states that did not raise their minimum wages.12 Figure B shows that in the states that raised their minimum wage between 2013 and 2018, wages among low-wage workers grew 5 percentage points faster than in states that did not change their minimum wage. Among low-wage women workers, these effects were even more pronounced: wage growth was twice as strong for women at the bottom of the wage scale in states that raised their minimum wages versus in states that did not. Too often discussions on the minimum wage focus narrowly on these questions of potential employment effects, but this is a deeply flawed way of evaluating the merits of the policy. Research has shown that—regardless of any employment effects—higher minimum wages have led to clear, sizable welfare improvements for workers, their families, and their communities that far outweigh any potential costs of the policy. For example, in an article soon to be published in the American Economic Journal: Applied Economics, Arindrajit Dube demonstrates that the income-boosting effects of higher minimum wages significantly reduce the number of families below the poverty line.14 Similarly, Kevin Rinz and John Voorhies—researchers at the U.S. Census Bureau—have shown that not only do higher minimum wages lead to increases in income for low-income families, but that those income gains actually accelerate in the years after the minimum wage is raised.15 Higher minimum wages have been shown to reduce rates of smoking and are associated with a slate of other improved measures of public health.16 Researchers at Rutgers University and Clemson University also find that higher minimum wages reduce recidivism and may reduce property crimes.17 This policy has been shown to achieve broad public good that should not be overlooked or obscured by claims by opponents that raising the minimum wage would lead to economic devastation that has never manifest with any previous minimum wage increase. Given improvements in productivity, low-wage workers in Connecticut and throughout the United States could be earning significantly higher wages today had lawmakers made different choices over the past 50 years. As such, the question for policymakers today should not be whether we can have significantly higher minimum wages, but rather, in what time frame we can achieve such levels. Raising the Connecticut minimum wage to $15 an hour by 2022 would finally raise the state’s wage floor to a purchasing power above the previous high point set in the late 1960s. It would simultaneously return the wage floor to nearly the same relative position it had in the wage distribution, undoing much of the growth in wage inequality that has occurred between wage-earners at the bottom and those at the middle. Research has shown that past minimum wage increases have achieved their intended effects, raising pay for low-wage workers with little to no negative impact on employment. Moreover, research that has looked beyond the narrow question of employment impacts has found clear, meaningful benefits from higher minimum wages to low-wage workers, their families, and their broader communities. I strongly encourage the committee and the full Connecticut legislature to pass H.B. 5004 and S.B.2 and help strengthen the future for Connecticut’s lowest-paid workers, their families, and their communities. 1. Inflation adjustment uses the Consumer Price Index for all Urban Consumers, Research Series (CPI-U-RS). See Bureau of Labor Statistics, “CPI Research Series Using Current Methods,” updated March 2018. 2. Projected inflation is from the CPI-U series published by the Congressional Budget Office. See Congressional Budget Office, An Update to the Economic Outlook: 2018 to 2028, “10-Year Economic Projections” (downloadable Excel file supplement), August 2018. 3. See National Employment Law Project, Consider the Source: 100 Years of Broken-Record Opposition to the Minimum Wage, March 2013. 4. Paul J. Wolfson and Dale T. Belman,“15 Years of Research on U.S. Employment and the Minimum Wage,” Tuck School of Business Working Paper no. 2705499, December 2016. 5. Isaiah Andrews and Maximilian Kasy, “Identification of and Correction for Publication Bias,” Mimeograph, October 10, 2018. 6. Sylvia Allegretto, Arindrajit Dube, Michael Reich, and Ben Zipperer, “Credible Research Designs for Minimum Wage Studies: A Response to Neumark, Salas, and Wascher,” ILR Review 70, no. 3 (May 2017): 559–592, https://doi.org/10.1177/0019793917692788. 7. Ioana Marinescu, “Most important paper on minimum wage effects since Card and @Alan_Krueger, according to @davidautor,” Twitter, @mioana, January 6, 2018, 6:40 a.m.
8. Doruk Cengiz, Arindrajit Dube, Attila Lindner, and Ben Zipperer, “The Effect of Minimum Wages on Low-Wage Jobs: Evidence from the United States Using a Bunching Estimator,” NBER Working Paper no. 25434, January 2019. 9. For greater detail, see John Schmitt, Why Does the Minimum Wage Have No Discernible Effect on Employment? Center for Economic and Policy Research Briefing Paper, February 2013. 10. See Arindrajit Dube, T. William Lester, and Michael Reich, “Minimum Wage Effects Across State Borders: Estimates Using Contiguous Counties,” Review of Economics and Statistics 92, no. 4 (November 2010). 11. See Sylvia Allegretto and Michael Reich, “Are Local Minimum Wages Absorbed by Price Increases? Estimates from Internet-Based Restaurant Menus,” ILR Review 71, no. 1 (January 2018): 35–63. 12. Elise Gould, State of Working America, Wages 2018: Wage Inequality Marches On—and Is Even Threatening Data Reliability, Economic Policy Institute, February 2019. 13. See David Cooper, Lawrence Mishel, and Ben Zipperer, Bold Increases in the Minimum Wage Should Be Evaluated for the Benefits of Raising Low-Wage Workers’ Total Earnings: Critics Who Cite Claims of Job Loss Are Using a Distorted Frame, Economic Policy Institute, April 2018. 14. Arindrajit Dube, “Minimum Wages and the Distribution of Family Incomes,” NBER Working Paper no. 25240, November 2018 (to be published in the American Economic Journal: Applied Economics). 15. Kevin Rinz and John Voorheis, “The Distributional Effects of Minimum Wages: Evidence from Linked Survey and Administrative Data,” Working Paper 2018-02, Center for Administrative Records Research and Applications, U.S. Census Bureau, March 2018. 16. J. Paul Leigh, Wesley Leigh, and Juan Du, “Minimum Wages and Public Health: A Literature Review,” February 27, 2018. 17. Amanda Agan and Michael Makowsky, “The Minimum Wage, EITC, and Criminal Recidivism,” September 25, 2018.